For the times where you can't get to a Wi-Fi point for Skype and you can't remember that 15 digit calling card code, there's Jajah. 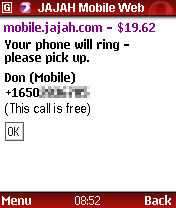 Jajah lets you make relatively cheap long distance calls right from your browser-enabled smartphone. How does it work? Well, just visit jajah.com from either your PC or your smartphone's browser, log in, and enter in the person you want to call. Jajah will call you, then the recipient, and connect the two. The best part is that if the person you're calling is also a Jajah member, the call is free (barring any mobile minutes you burn up on your cellphone plan). We spoke with Jajah yesterday gathered additional information. Jajah says they have 70-ish phones supported right now, and any phone with a mobile browser should be able to log in and initiate calls. They've also got Java and Symbian plugins for an embedded version, so you won't have to pull up the webpage—you can start the call from the app. The service is mostly targeted at mobile professionals and people who have family over seas. Instead of making expensive calls from their cellphones, they can have Jajah initiate the call and pay substantially less. It's not quite cheaper than using Skype or even a calling card, but unless you're always in the office or always have your calling card with you, this is an easier alternative. As for the quality, Jajah claims that from what they've seen, most people can't tell the difference between a Jajah call and a standard call. We had noticeable delay on one of our test calls between two cellphones, but Jajah blamed that on the quality of the "last mile" provider, aka, the cellphone provider. There are also conferencing and scheduling features, which makes getting together with multiple people cheaper and easier (if you've got their information entered in) than otherwise. Although the price is a bit more expensive than other options, the convenience of being able to dial up people from your smartphone makes Jajah something worth looking into.